Preheat oven to 240ºC (or 220ºC fan forced). Rub 2 teaspoons of the oil over pork skin. Season with salt. Heat 2 teaspoons of the oil in a large, non-stick frying pan over medium-high heat. Cook pork, skin-side down, for 7-8 minutes or until golden and crisp. Transfer pork, skin-side up to a baking dish (pork should fit snuggly in dish). While the pork is browning, heat the milk, thyme, garlic and one quarter of the onions in a small saucepan over medium heat, until just simmering. Remove from heat. Season. Carefully pour milk mixture around pork, being careful not to pour any milk mixture over the skin. Milk should come all the way up the sides of the pork, leaving skin uncovered (you will have extra milk mixture to top up during cooking). Bake pork for 20 minutes. Reduce oven temperature to 180ºC (or 160ºC fan forced). Bake for a further 1 hour or until pork is tender and skin is crisp. Meanwhile, place cream and nutmeg into same small saucepan. Heat over medium heat until just simmering. Season. Remove from heat. Heat 1 tablespoon of the remaining oil in a large, flameproof baking dish over medium-high heat. Cook half the remaining onion, stirring, for 5 minutes or until softened. Add carrot, parsnip and potato to dish. Stir to coat. Season. Pour over cream mixture. Remove from heat. Sprinkle with cheese. Cover with foil and bake for 25 minutes. Uncover. Bake for a further 25 minutes or until vegetables are tender and light golden. Sprinkle with extra thyme leaves. In the last 10 minutes of pork cooking time, heat remaining oil in same large frying pan over medium-high heat. Cook remaining onion, stirring, for 5 minutes or until softened. Add kale and cook, stirring, for 3-4 minutes or until wilted. Add juice and nuts. Stir to combine. Season. 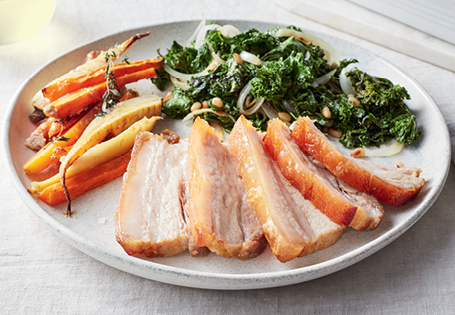 Serve pork, cut into thick slices, with root vegetable gratin and kale. Note: Pork belly is one of the most succulent cuts of meat. Braise it in milk to keep it beautifully moist and tender. Pair with the crispy crackling for a winning roast!